There is once again for any explanation here. This is almost the best barometer you can find around for Business Intelligence tools and technologies. 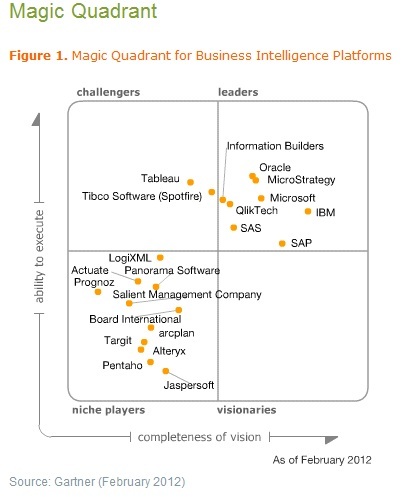 Its interesting that all the Visualization tools like Tableau, Spot Fire are graded as Challengers and Qlikview as a leader with in-memory and columnar based visualization technologies. One thing we sure have lost is the visibility between MOLAP and ROLAP tools as many big vendors started offering multiple solutions like Oracle with OBIEE, Hyperion, Brio and SAP with Business Objects, BW, Crystal Reports, Xcelsius. Being open source, both Jaspersoft and Pentaho have been in the ‘niche’ category. We still have to wait a few more years before open source BI tools become the ‘Linux’ of Business Intelligence tools. If you do like java and .net and like to embed BI technologies as part of your offerings and integrate into your web applications and portals, I do suggest a closer look at LogiXML. How many of us do think this BI space need further consolidation? I surely do miss BIRT as part of this quadrant even though some may consider that as part of Actuate. We also did miss side by side comparisions of 2011 and 2012 to see who is improving.